The All Progressives Congress (APC) on Saturday threatened to reject the results of the governorship election in Anambra if voting did not take place in all the local governments. 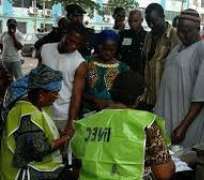 A statement from its Interim National Publicity Secretary, Alh Lai Mohammed, said it would reject results from its strongholds of Idemili North, Idemili South and Awka South. The party condemned the shortcomings in the voters' register which omitted the names of many voters. It also demanded the immediate removal of the Resident Electoral Commissioner for Anambra, Prof. Chukwuemeka Onukogu. ”Before the election, political parties were given voter’s registers that largely contained the names of most voters. “However, about four days to the election, INEC said at a stakeholders' forum that there were problems with the register, which would be rectified before the election. ”However, when the supposedly-corrected registers were brought back, most of the authentic names in them have disappeared without explanation,” it further stated.